In B2B marketing, we’re used to segmenting our audiences. Often this will be by vertical or stage of the sales cycle or geography. Chances are, however, that the only audience that really gets considered most of the time is customers/prospects. After all, they're the ones spending the money. Stands to reason that they’re the ones we need to influence. The problem is, by only focusing on customers, you could be harming your results. Because, in a B2B environment, you need to look at both external and internal audiences to be successful. More than this, you need to consider the overlap between them. While everyone talks about sales and marketing (mis)alignment, it’s actually at the intersection of these three groups that you should place most of your focus. In Thomas Barta and Patrick Barwise’s excellent new book, The 12 Powers of a Marketing Leader, they talk about operating in ‘the V-Zone’. This is the intersection of 'customer needs' and 'company needs' where true value is created. They see this as a critical component for how today’s marketing leaders can increase their effectiveness and influence within an organisation. It’s where the big strategic issues can be found (keeping marketing leaders out of the weeds of the never-ending tactical options that take up too much focus in many marketing departments). I would argue that this offers two parts of the picture but lacks an activation element (which in B2B is sales). In its defence, the 12 Powers approach is totally focused on marketing leadership and how it links to business strategy, so sales would probably be seen as one of the tactical outputs. The book is also not specifically focused on B2B where sales has a different quality (than FMCG/retail). It’s a great book though, you should buy it. So what does this intersection look like? Let’s look at each part of the equation individually before bringing them together. Understanding customer needs should be home turf for most marketers. However, many struggle to invest the required budget to discover something that is unlikely to deliver payback in the next quarter. As a result, they tend to use general assumptions or, worse, make-believe personas in the place of real insight. We’d argue that this kind of research is always money well spent as it will deliver a dividend across everything you do thereafter — from how you target customers, to what you say to them, to what you say about them within the business. What’s more, it doesn’t have to be as difficult or time-consuming as many think (contact us to learn how). Importantly, this is about understanding what customers really need not what we wish they needed (wishing doesn’t make it so). More than this, it’s about recognising the needs that we can ultimately help address. It’s sounds obvious but too many content marketing approaches get distracted with things that customers may find interesting but which don’t lead back to any kind of revenue impact for the business. In many ways, getting a grip on the company’s objectives shouldn't be a problem. After all, marketing sits within the business. But the reality is often more opaque. In our recent Revenue Rift report, the #1 barrier to marketing hitting its pipeline and revenue targets was ‘Lack of clarity from management’. Now, of course, this is a two-way street. Senior management should be clearly communicating where the business is headed. However, marketing is also responsible for extracting the information and interpreting it within a marketing context. All too often, marketing will simply look at a small part of the overall business objectives (eg the sales targets — of which a proportion falls under marketing’s remit). This will significantly limit marketing’s value to the business. While marketing tends to place most of its focus on just the first of these, it has the opportunity to deliver significant impact across all five. In doing so, it can move from a tactical operation that’s the first to have its budget cut to one that's core to what really matters to those that hold the purse strings. Here we do come to the issue of marketing and sales alignment (this came in as the #3 barrier to success in the Revenue Rift report). Without sales and marketing being on the same page, both departments will fail to reach their full potential. Importantly, this is not about marketing simply serving the sales function with ‘leads’. Nor is it about sales simply actioning those leads fed to it by marketing. It must be a meaningful collaboration that delivers a multiplier effect to the business as a whole. Having a shared language about what success looks like — What are the overarching objectives? What are the timescales? What are the barriers? Who is responsible for what? Agreeing who we’re targeting — What is a ‘lead’? Are we going broad or deep? When should a lead move to sales? When should it move back? Is it about leads at all or should we be more focused on sales and revenue? Identifying where to place our efforts — Do we primarily need more leads or do we need to convert more of what we have? Should we focus on existing markets or open up to new ones? Where are the points of friction in a sale? Can these be either eliminated or minimised? Creating the right kind of content and communications — Are we creating the right kind of stuff (that sales will actually use)? Are we delivering the right kind of messages at the right time? Are we clearly focused on moving prospects through the sales cycle? Knowing what’s working (and what’s not) — What are we measuring? Is that meaningful for the business? Do we have both lagging and leading indicators of success? Is everyone clear on the results? Success really does have a significant impact. MarketingProfs research has shown that businesses that tightly align their sales and marketing functions get 36% higher customer retention rates and 38% higher sales win rates. Not too shabby. While succeeding with any of the three key audiences will deliver benefits, finding the sweet spot in the middle will pay exponentially higher dividends. This is why in our own strategy workshops we aim to have input from all three groups. This means carving out some time in our internal audiences’ diaries (or at least getting an interview call with the CEO or CFO or both) as well as carrying out some customer research (even if that's simply conducting a limited number of phone interviews). 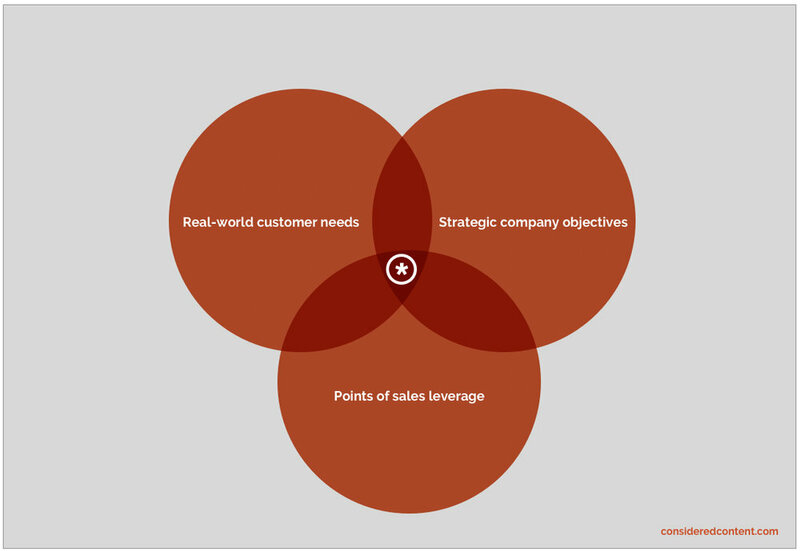 Ultimately, we’re looking to focus on a core group of real-world customer needs (three is ideal, no more than five), the core strategic objectives for the business as a whole, and the addressable points of leverage for sales. But what if we were just to focus on two of the audiences? If we go with real-world customer needs + strategic company objectives we’re likely to be in the area of long-term value creation (the V-Zone in The 12 Powers of a Marketing Leader). This is a good thing. It means marketing can play to its strengths in customer knowledge and sync with senior management in terms of what really matters to the business. It is, however, a long term play. The result will be a strong brand that resonates with customers and supports the business’s vision but it will take time. If we go with combining points of sales leverage + strategic company objectives it'll probably result in the kind of traditional push marketing you get in heavily sales-led organisations. You see this in businesses that are highly product focused and which believe that people would buy their products if only they knew about them. Sometimes they’re right. More often they’re not. Finally, if we go with points of sales leverage + real-world customer needs we’re likely to see a reasonably effective demand generation programme. This will have the benefits of marrying what customers are looking for with what we’ve got to sell. It will deliver results faster but runs the risk of underachieving against the objectives that really matter to senior management. The optimum result will be to focus dead centre. This will bring together what matters to both customers and the business with a way to deliver against it in a timely manner. This means taking a multi-perspective view of the challenge. It will almost certainly mean creating an integrated approach to the resulting activity. But it will be a solution that delivers the kind of success that really counts in B2B today.